Phuket International Airport receives more than 20 flights a day from Bangkok, as well as a few daily services from Chiang Mai, Samui, Pattaya, Singapore and Kuala Lumpur, and several flights a week from Hong Kong. From Bangkok, the flight is about one hour. Current timetables for flights to Phuket are shown below, although some services are reduced during the low season. Flights to Phuket include numerous budget options costing about US$50 one-way. Airport transfers are simple. The airport is at the far north of the island, some 30 kilometers from Phuket Town and quite far from Patong Beach and Jungceylon. It is best to use one of the two officials transport companies with booths right inside the arrival lounge. Prices are fixed 700 – 900 THB. for an Airport Limousine or 150 THB. per person for a minibus to get to the major beaches at the south or west of the island. The Airport Bus is a cheaper alternative as long as you are not in a rush. Ask at the airport for their current departure schedules and pricing. All fares must be negotiated before the ride. These taxi riders are easily identified by their special colored jackets identifying the location of their home base. Many have the word ‘taxi’ written in English on this jacket. Do not take a taxi from anyone who is not wearing one of these jackets. If you want your own private taxi, look for a tuk tuk, a tiny minitruck converted in the manner of the bigger song-taew above to carry about four (or more) passengers. The tuk-tuk gets its name from the noise its little engine makers. There are fleets of those in all major tourist areas, and they will take you anywhere for a price. 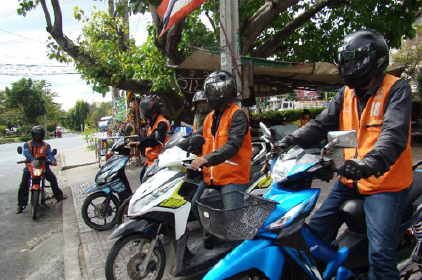 The going rate for the relatively short ride between Patong and Phuket can be as much as 450 THB per one way. You can attempt to bargain but don’t expect much movement on their prices and be aware that at night the price of tuk-tuks shoots up. You can also rent one of these tuk-tuks for the day. Expect to pay around 2,000 B. or more. This can be a good way to get about the island if you prefer not to drive yourself. 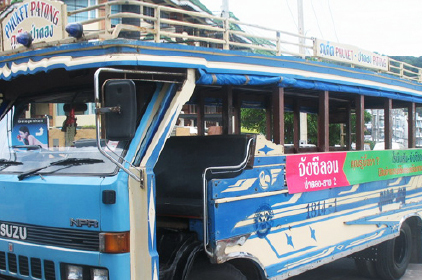 There are few buses on Phuket and the main form of transport from beach to town is the “Song- taew”, a truck converted to carry passengers in the back on two long benches. They are usually colorful with a sign on front showing where they are going. 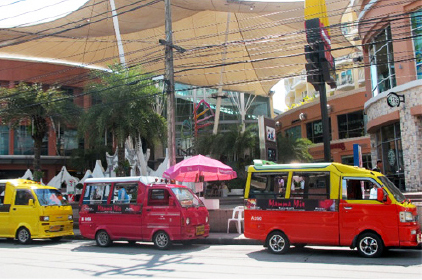 These vehicles leave from a set stop by the fresh market in Phuket town, reaching every major beach area on the island. They run approximately every hour but there are no fixed scheduled, and they run when there are sufficient passengers. When leaving the beach areas to head back to town they usually cruise around the streets, slowly, picking up passengers. It is slow, but cheap, with the fare from Phuket town to Patong now set at just 35-50 THB. per person! The airport is at the north of the island, some 30 kilometers from Phuket Town and quite far from Patong Beach and Jungceylon. It is the best to use one of the two official transport companies with booths right inside the arrival lounge. Price are fixed rate 800 THB for an airport limousine. 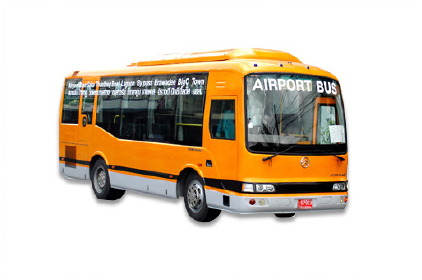 The airport bus is a cheaper alternative as long as you are not in a rush. Ask the airport for the current departure schedules. The price is 150 THB per person for minibus to get to the major beaches at the south or west of the Island.